The first phase of work focused on a review of the documentation about the site that was held in archives covering a period of over 60 years, which was found to be partial and incomplete . However, through an examination of the records it was possible to locate and reconstruction several of the original contexts from which belong some of the material now displayed at Monte Rinaldo and at the National Archaeological Museum of Ancona. The first phase of work also included a systematic study of the previously excavated architectural clay decorations . In mid-June 2016 a first field campaign of non-invasive archaeology was undertaken though a geophysical and topographic survey with the aim of assessing the potential for further buried remains and to document the various architectural elements. 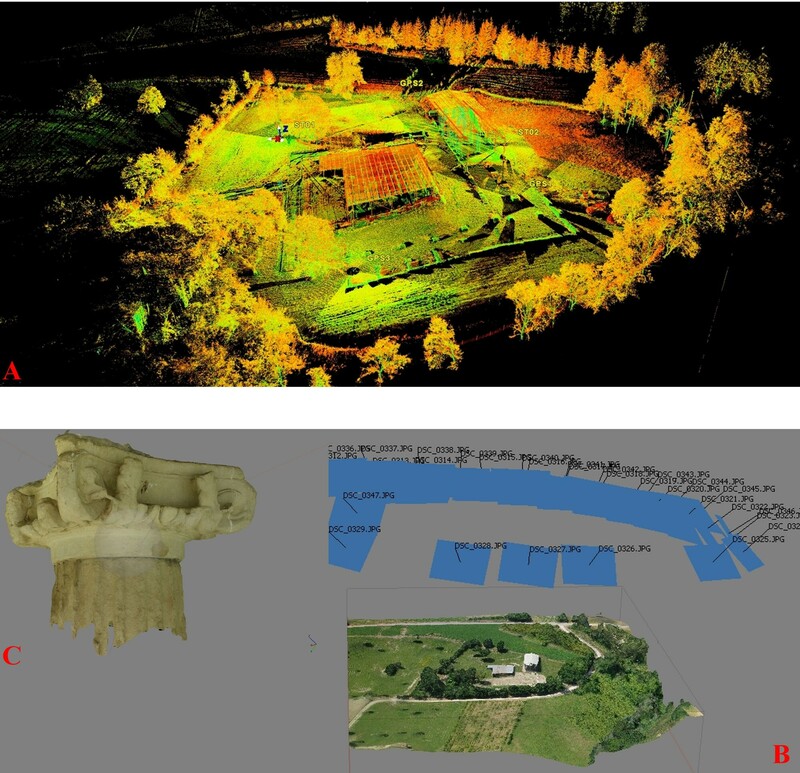 Building upon these results, it was possible to create a new georeferenced plan of the site (scale 1:50) as well as a 3D photogrammetric documentation for the analysis of all the architectural elements. 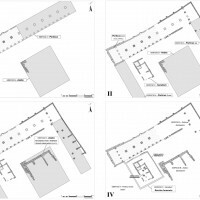 The integration of this new data together with those previously studied has led to a new interpretation concerning the chronology and building phases of the site in addition to a new proposal for its architectural reconstruction (Fig. 2, Fig. 6). 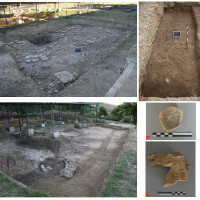 Between 2017 and 2018, the first two field campaigns of archaeological excavation were conducted by the University of Bologna. During the first season three areas were investigated to the North, South and inside the temple. In the second season, work focused on the western part of the sanctuary which was previously unexplored, and which corresponds to the sacellum (Building C). Analysis of the stratigraphy has allowed new information to be recorded concerning the establishment of the sanctuary and its later abandonment, but above all, for a link to be hypothesised between its origin and the Latin colonization of Firmum Picenum, and more generally, to the Romanization of Picenum between 3rd and 2nd century BC  (Fig. 3). 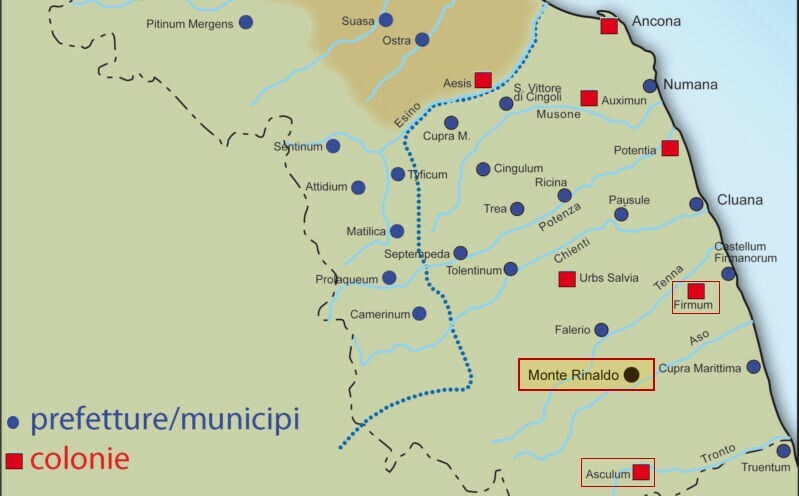 The area of Monte Rinaldo was occupied by Rome after the conquest of the Picenum (268 BC). In the aftermath of the conquest, which also included the Tenna and Aso valleys, the Latin colony of Firmum was deducted. The Aso valley, in the most precise historical reconstruction, represents the southern band of the colony’s ager, bordering the territory of the federated city of Asculum . The proximity of Monte Rinado to the southern boarder also highlights its role as a probable boundary sanctuary. This hypothesis should be critically evaluated as this type of sanctuary may be a modern reconstruction based on settlement models linked to the Greek world and furthermore, the idea of a border in a pacified region, nevertheless subject to Rome, implies a more complex explanation . A further aspect to consider is that the Aso valley, which may have initially gravitated towards the Latin colony of Firmum, could have progressively acquired its own administrative autonomy and may have been populated by Roman colonizers in the following centuries. 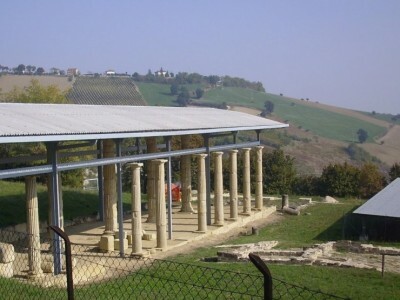 The sanctuary at Monte Rinaldo may also have had a central role in the territory, not only for religious activity, but also as an administrative and economic centre. Indeed, although on a smaller scale, the Aso valley denotes a geographical analogy similar to most of the valleys of the Marche region, with its river flowing between watershed ridges which become steep moving away from the coastline to the internal area. These hillcrests separate the various parallel water catchments that drain the from the Apennines to the Adriatic Sea. The Roman settlement phenomena witnessed in this mid-Adriatic area usually implies at least one centre in the middle of the valley, often paired with a port settlement at the mouth of the river. In terms of the Aso valley this pattern does not comply, especially if the placement of the ancient municipium of Novana within this territory is excluded. In the light of recent archaeological findings, and in accordance with Pliny, most studies now place Novana more internally. The suggestion of locating this centre in the middle of the Aso valley would therefore be excluded . 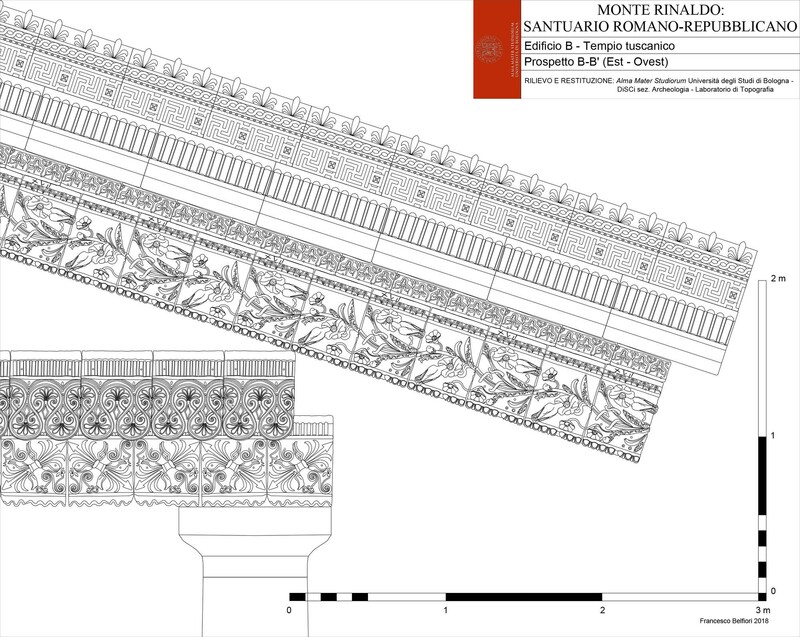 In this scenario the role of the sanctuary of Monte Rinaldo in the populating this area of Picenum should be given a more detailed evaluation, especially through the methods offered by landscape archaeology. At Monte Rinaldo, similarly to the sanctuary of Colle dell’Annunziata at Ascoli Piceno , the stratigraphic contexts that are associated to the first phases of occupation of the area yielded pottery that is linked to the “indigenous” culture of Picenum, in association with black glazed pottery which is clearly linked to the arrival of Latin colonizers throughout the 3rd century BC. Given the regularity with which this occurs, it seems unlikely that this material can only be considered residual of a previous indigenous cultic area where the later sanctuary was built. This interpretation is now the subject of an intense critical re-examination . The persistence of this phenomenon following the Roman conquest of the territory also leads to further considerations (Fig. 4). 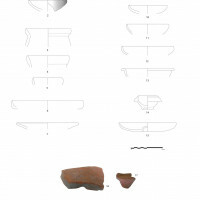 An analysis of the stratigraphy and material from the two seasons of excavation suggests that the site was first frequented in the 3rd century BC perhaps as a sub divo cultic place (or still not monumentally structured) in connection to the Latin colonization of Firmum, as is suggested by the presence of pottery which is dated to this chronological period (even though it was retrieved in secondary position in 2nd century BC contexts). As noted above, the heterogeneity of the material suggests that the sanctuary may have been a meeting place, perhaps for the integration of the new colonizers with the existing population after the Roman conquest of Picenum. In the successive phase the first monumental Tuscanic-style temple was built on a podium (first half of 2nd century BC) with a portico on the northern side of the square (Fig. 5). During the second half of 2nd century BC the complex underwent reconstruction and new structures were built where parts of the architectural decoration of the first phase were also reused. The Tuscanic temple was reconstructed in the form that is still partially visible today, and a new architectural decorative cycle was added. 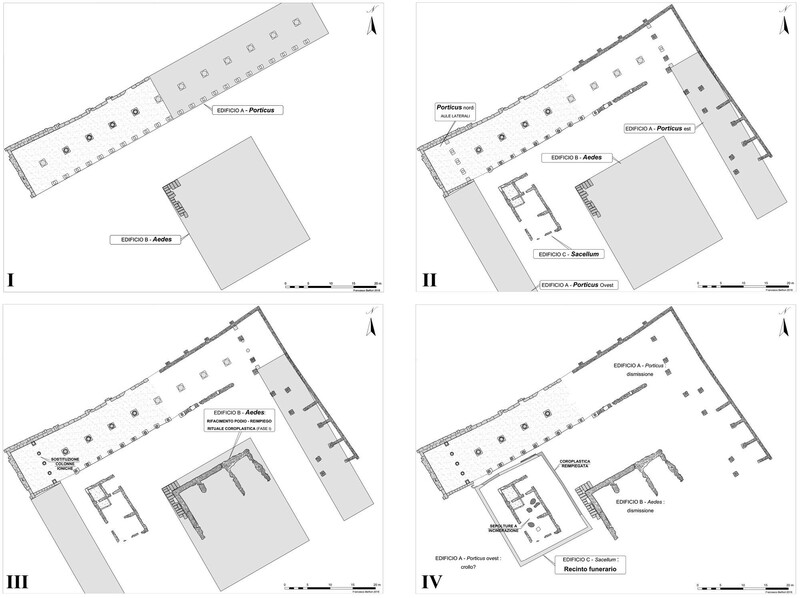 The temple (Building B) was built off-centre in the square, probably to allow space for the sacellum which was also built in this phase, and which was probably connected to the ritual use of water from a nearby spring (Building C) . The square, on a plateau that opened scenographically to the South, was bordered on three sides by a portico. The Eastern side presents a sequence of tabernae, in front of which was a portico. Due to the poor state of preservation, the structures to the west are more difficult to understand. The earlier Northern portico had a rear wall in opus quadratum which retained the rear slope. An Ionic-Italic colonnade followed a median line, dividing it into two parts, whilst a Doric colonnade built above a short staircase faced towards the square. In this phase, the sanctuary was modified to follow the more standard Hellenistic architectural style. The new physiognomy of the sanctuary is therefore a consequence of a renewed architectonic koine and has comparisons with other temples in the region such as Colle dell’Annunziata at Ascoli Piceno, or sanctuaries in the Abruzzo region of Pagliaroli at Cortino and of Colle S. Giorgio amongst others , as well with more notable Latin examples. The ongoing study will continue to focus upon the reconstruction of the structure and the architectural decoration as well as the phasing of the Northern portico and its roof. The lower portico was enriched by two lateral spaces with Ionic columns possibly added during 1st century BC . The sanctuary at Monte Rinaldo was destroyed during the Late-Republican period and the site was later reoccupied in the early Imperial period by a rural complex that reused some of the architectural decorations as building material. An important portion of this structure emerged during the 2018 excavation season in the area where the western part of the portico is supposedly located and future excavations will continue to examine this area. Finally, further confirmation was made during the last excavation season concerning the deities to which the sanctuary was dedicated: the finding of new inscriptions engraved on black glaze pottery enriches the panorama of already known inscriptions from the old excavations and leaves little doubt that the sanctuary was dedicated to Jupiter, possibly as the major deity, together with the worship of other deities, amongst which was Hercules . Fig. 1: The sanctuary of Monte Rinaldo in the Piceno region. Fig. 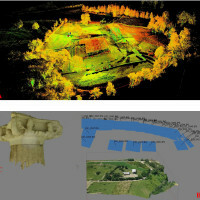 2: A- Laser scanner Leica P30 Point cloud: B- Image based photogrammetric mapping of the site of the sanctuary; C- Image based photogrammetric mapping of the architecture of the sanctuary. Fig. 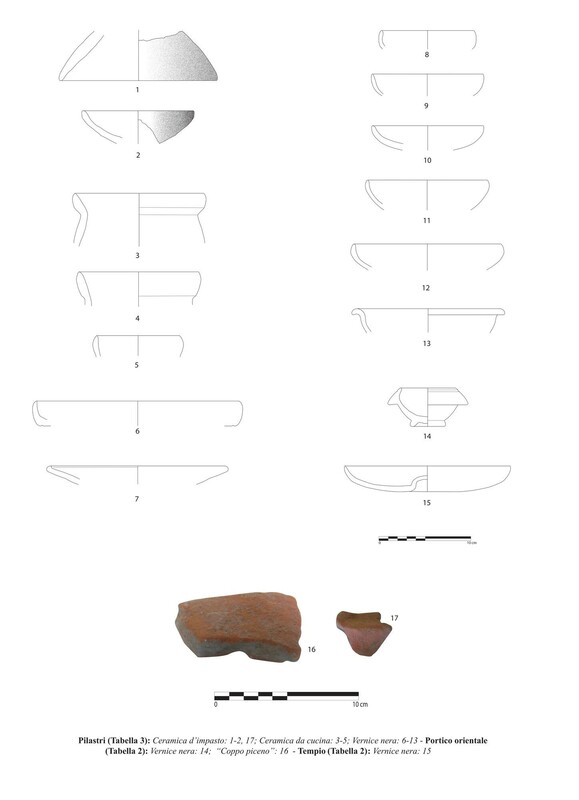 3: A-B-C Survey areas of the first excavation season of the University of Bologna (2017); D: stamp “Iovei Sacrum” on black glazed cup; E: terracotta horse head relating to a continuous frieze from the area of the main temple. Annibaldi, Giovanni. 1973 .‘Monte Rinaldo’. EAA Suppl. 1970, 502. Roma. Belfiori, Francesco. 2016. ‘Santuari Centro italici e romanizzazione. Valenze itinerarie e processi acculturativi’. in Santuari mediterranei tra Oriente e Occidente. Interazioni e contatti culturali edited by Alfonsina Russo Tagliente and Francesca Guarnieri, 181-191. Roma: Scienze e Lettere. Belfiori, Francesco. 2018. ‘Il ruolo dei luoghi di culto e l’espansione di Roma in Italia centrale‘, Atheneum 106/1: 95-110. Bernetti, Sara. 2009. ‘Il municipio di Novana nel Piceno: un’ipotesi di localizzazione‘. Ostraka 18/1: 99-118. Demma, Filippo 2016. ‘Architetture della “conquista”: elementi per la ricostruzione di un dialogo culturale’, in L’Italia centrale e la creazione di una koiné culturale? I percorsi della “romanizzazione”, edited by Michel Aberson, Maria Criestina Biella, Massimiliano Di Fazio, Pierre Sánchez and Manuela Wullscheleger, 365-391. Berne: Peter Lang. Demma, Filippo. 2018. 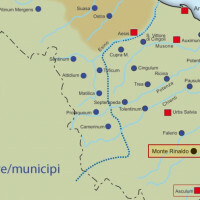 ‘Monte Rinaldo: sessanta anni di ricerche e restauri presso il santuario romano de La Cuma’. Picus 38: 95-152. 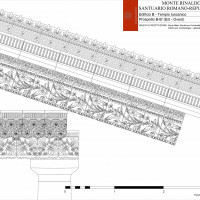 Demma, Filippo and Francesco Belfiori, forthcoming, “Il santuario romano di Monte Rinaldo nel Piceno: architettura, decorazione, culto”. in Deliciae Fictiles V. Network e Officine, edited by Carlo Rescigno and Patricia Lulof. Demma, Filippo, Enrico Giorgi and Stephen Kay. 2018. ‘Monte Rinaldo (Comune di Monte Rinaldo, Provincia di Fermo, Regione Marche)’, Papers of the British School at Rome 86: 306-309. Giorgi, Enrico and Filippo Demma. 2018, ‘Riflessioni sulla genesi e lo sviluppo urbano di Asculum nel Piceno dalla città federata alla colonia romana’. ATTA 28, 2018: 53-76. Giorgi, Enrico, Filippo Demma and Francesco Belfiori, forthcoming, ‘Monte Rinaldo. “Vecchi” dati e nuove prospettive’, in Roma ed il Mondo Adriatico: dalla ricerca archeologica alla pianificazione del territorio. Giorgi, Enrico, Filippo Demma and Stephen Kay, forthcoming, ‘Monterinaldo: a Roman Sanctuary in the Middle of the Picenum’, in Proceeding of the XIXth International Congress in Classical Archaeology (19th ICCA, Cologne-Bonn, 22-26 May 2018). Guidobaldi, Maria Paola. 1995. ‘La romanizzazione dell’ager Praetutianus’, Napoli. Iaculli, Gabriele. 1993. ‘Il tempio italico di Colle S. Giorgio (Castiglione Messer Raimondo)’, Penne. Landolfi, Maurizio. 2000. ‘Il santuario ellenistico-italico di Monterinaldo’. Atlante dei Beni culturali della provincia di Ascoli Piceno. Beni archeologici, edited by Giuliano de Marinis and Gianfranco Paci, 127-133. Cinisello Balsamo. Milano: Arti Grafiche Amilcare Pizzi. Landolfi, Maurizio. 2005. ‘Il santuario ellenistico-italico di Monte Rinaldo (AP)’. Arte romana nei musei delle Marche, edited by in Giuliano de Marinis, 8-19. Roma: Istituto Poligrafico dello Stato. Menchelli, Simonetta and Eleonora Iacopini. 2016. ‘Novana, its territory and the Pisa South Picenum Survey Project II’. Fold&r 353: 1-20. Smith, Christopher. 2017. ‘Ager Romanus Antiquus’. ArchCl 68: 1-26. 1. Annibaldi 1973; Landolfi 2000; Landolfi 2005; Demma 2018; Demma 2016; Demma, Giorgi, Kay 2018; Giorgi, Demma, Belfiori forthcoming; Giorgi, Demma, Kay forthcoming. 2. Demma 2018; Demma, Giorgi, Kay 2018. 4. Belfiori 2016; Belfiori 2018. 5. Giorgi, Demma, Kay forthcoming. 7. Bernetti 2009; Menchelli, Iacopini 2016. 9. Landolfi 2005; Giorgi, Demma, Kay forthcoming. 10. Demma 2018; Giorgi, Demma, Kay forthcoming. 11. Iaculli 1993; Guidobaldi 1995; Demma 2016; Demma, Belfiori 2018; Giorgi, Demma 2018. 12. Giorgi, Demma, Kay forthcoming. 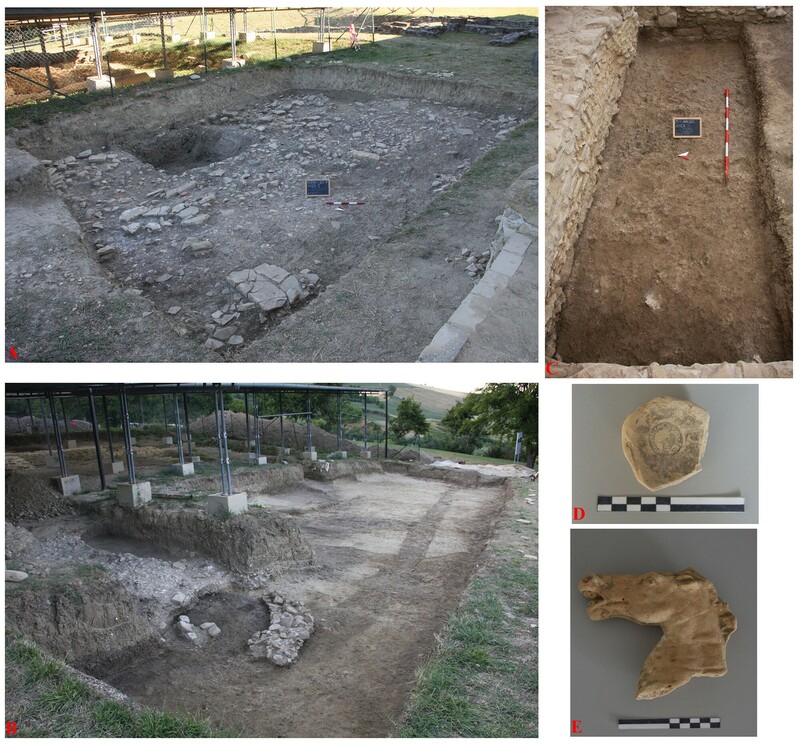 Francesco Belfiori, Stephen Kay 2018, ‘New research at the Sanctuary of Monte Rinaldo (FM)’, in Groma 3. doi: 10.12977/groma17.